People for Plants' Kakadu Plum, Calendula and Chamomile Eye Cream* landed on my door step a week and a half ago and, given that I can't reach my Kiehl's Creamy Eye Treatment with Avocado, I decided to give it a shot. So far I'm really impressed with it. It does a great job of hydrating the under eye area without irritating it and it's really gentle and lightweight. I've been breaking out a little more than normal because I'm not using as many tailored products as I was previously but I've found the Aesop Oil Free Facial Hydrating Serum to be really great at healing and calming breakouts before they turn into something big and nasty. It's also really lightweight so I have found myself using this product morning and evening. I don't know what it is but my skin's been feeling quite congested lately and my Clearasil Daily Clear Vitamins & Extracts Scrub* has been a lifesaver. This is one of the first products I've tried from Clearasil and I must admit, I'm pretty impressed with it. It's a manual exfoliant that's gentle enough to use daily (though I tend to use it every second day) and I've found that it's really improved the texture of my skin. It also gives my skin a really great deep cleanse and I feel like my the products I use on top absorb quicker. It's also taken care of a few pesky black heads too! Finally, it's not a skincare post without a spot treatment and I am head over heels for Murad's Blemish Spot Treatment! This is one of the best spot treatments I've ever tried (if not the best) and I would highly recommend it to anyone. I normally find that spot treatments are ineffective on blind pimples however I used this bad boy on one I felt coming up on my chin and it was gone in the morning. It's love! 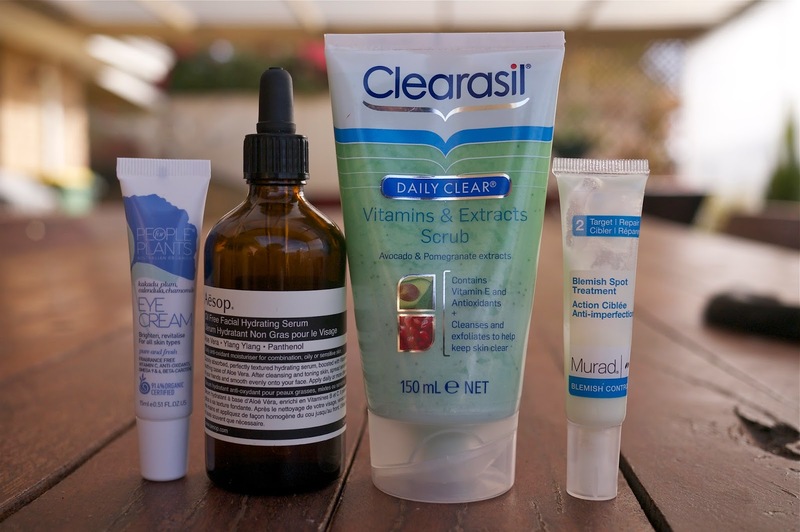 This post was written in conjunction with Clearsasil who kindly sent me an extra tube of Clearasil Daily Clear Vitamins & Extracts Scrub to giveaway to a lucky reader! This giveaway will be open for two weeks, ending at midnight on June 5. The winner will be announced soon after. If you're under 16 years of age, please get the permission of a parent or legal guardian! This giveaway is open internationally. Have you tried any of these products? What're your skincare loves at the moment? I love Bioderma Sensibio H2O Micellaire Solution. LUMENE MATT TOUCH BALANCING GEL CLEANSER has been my best friend for as long as I can remember for my mixed skin problem. I am loving olay thermal exfoliator, it literally feels like I'm polishing my face with warm beads....it's amazing! Frezyderm mild wash foam for sensitive skin! I'm absolutely loving the FAB Facial Radiance pads at the moment! I'm loving the Estee Lauder Advanced Night Repair II! I love my Bioderma Sensibio H2O Micellaire Solution. Hello! Lately I've gone back to an old school skin cleansing route because my skin was so out of balance. I wash my face with a Buf-Puff exfoliator and gentle Purpose soap. It really helps to put the pH back into a healthy place. Thank-you!! 100% Pure green coffee bean eye cream is just amazing!! One of my all time favourite skin products has got to be Clearasil Ultra Extra Strength Acne Treatment Cream. It's an acne/blemish cream and is perfect for oily skin. I haven't tried the raved about La Roche Posay Effaclar Duo, but I feel like this is a great alternative if you're prone to breakouts. I recently purchased the Garnier Pure 3-in-1 Wash, Scrub + Mask and it really feels like it's making a difference to my skin if I use it as a mask. I have become fairly obsessed with the SHE Red Rice Exfoliating Powder recently! It's so gentle, but manages to scrub away any dead skin, leaving my face feeling baby smooth. hola, pues me gusta mucho una crema de día de biotherm!!! A Clarins serum that I got from my mum - it's awesome. I'm loving Clinique's Dramatically Different Moisturising Lotion atm! Melvita Cleanising Milk is the product I'm loving most right now, I love Melvita products.